Some premium food brands have developed diets that help manage and prevent health issues such as dental disease, hairballs, obesity and allergies. We have a range of these products available in clinic. Make sure the food is fresh. When you purchase pet food, check for freshness and purchase only the amount necessary for your pet. Store pet food in a cool, dry place and keep it tightly closed. Discard uneaten food and always place fresh food in a clean bowl. In general, hard food (or "kibble") is preferred for maintaining and minimising tartar build-up. Soft, canned food tends to be more palatable and can be stored for longer. Feed the right amount. Ask us or check the label for how much to feed according to your pets ideal weight (not necessarily the same as their current weight). Avoid feeding pets as much as they want or feeding a large amount at one time. Doing so can lead to obesity, gastrointestinal upset, or even bloat, a life threatening condition. 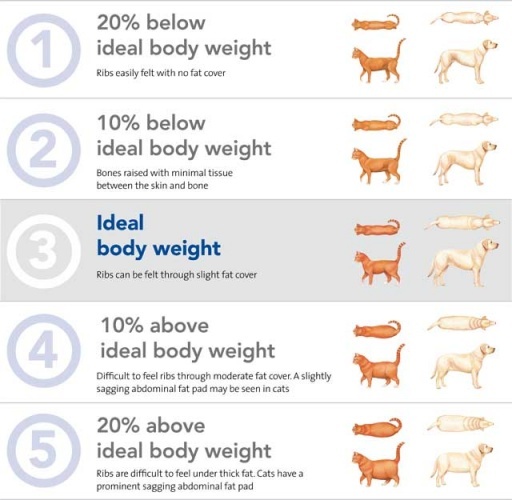 This image scale below helps you visually assess your dogs body condition. Ideally dogs are Body condition score 3/5. How does your dog rate??? increased surgical and anaesthetic risk. What is your dogs optimum weight? Regular exercise is essential to achieving and maintaining weight loss. A daily exercise routine is great for dogs. Gradually build up to a minimum of two 10-15 minute brisk walks a day. Feed only the specified diet. Resist the temptation to give snacks or treats. Measure out the quantity of food using scales or a cup. Feeding separated from any other dogs will prevent stealing from other bowls. Exercise and play are better rewards than food!